How're You? 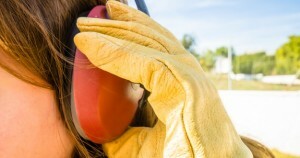 Protect your hearing | How're You? Think hearing loss just happens to older people? A recent study showed that 1 in 5 adolescents are already showing signs of noise-induced hearing loss.1 Young people are listening to music at high volumes for prolonged periods of time, not realizing the damage they are causing. Sounds over 105 dB put you at risk if you are exposed for 5 minutes or more daily. For example listening to high volume on your personal stereo is 105 dB and a rock concert is at least 110 dB. A vuvuzela, the plastic trumpet fans blow at World Cup soccer games can have a sound level of 120 dB, which is unsafe at more than 9 seconds daily. Think about where you encounter loud noises on a daily basis. Perhaps it’s on your commute to work via subway, or attending your children’s indoor swim meet. Not being able to understand the conversation around you is a good indication that the sound your ears are receiving is too loud. There is an unfortunate trend at sporting events and school assemblies to encourage the crowd to scream as loud as possible as a way to cheer. For example, the Seattle Seahawks set a record in 2013 at 136.6 dB, which was shattered recently by the Kansas City Chiefs at 142.2 dB. It’s such a shame that shattering hearing is considered a way to show support and has become a contest. Get your hearing tested. Speak to your doctor if you have persistent ringing in your ears, an early sign of noise-induced hearing loss. Listen safely. Use earplugs in noisy environments and keep some in your purse or gym bag. Foam earplugs are available at your local drug store and can reduce sound by 30 dB, making the sound of a loud action movie bearable and at a level where you can still hear the dialogue. Set a limit for personal stereos when listening in a quiet room. Be aware that noisy toys can harm children’s hearing, especially if held close to the ear. If your ears are ringing or feel muffled after noise exposure, make sure to have some quiet time so they can recover and see your doctor. Speak up. Ask for the volume to be turned down — you’re probably not the only person finding it too loud!